Holidays, birthdays, special occasions and "just because" moments are opportunities to give a gift to someone you care for. There's something very personal and meaningful about a gift that you took the time to make yourself. Grant your friends and family that extra special feeling with one of these 100 homemade gift ideas. There's something here for every occasion and season, not to mention ideas for everyone in your life. Candles add warmth, light, and coziness to every space. They make an excellent gift for almost anyone! When you make them yourself, not only can you customize the color, scent, and look, but the added gesture makes the gift twice as unique. Learn how to get started making homemade candles, and soon you'll never purchase store-bought candles again! If you're getting gift cards for friends and coworkers this year, make the gift feel more unique and personalized with this embroidered leather card case. This tutorial will teach you how to embroider on leather (it's not as tricky as you'd think!) for a wallet-like feel to the case. It's pretty, elegant, and much more meaningful than a paper envelope. You'd be hard-fought to find someone today who doesn't use their phone or tablet to refer to recipes. The problem with that, is you often end up with a wet and sticky screen. This easy 3-material DIY helps prop your iPad up while you chop, simmer and stir, so you can cook without fear of ruining your tablet. Think what a great gift this will make! Skip the expensive visit to a trendy soap store and learn to make your fizzy bath bombs at home. These soaps are quite popular, and they make an exciting yet simple gift. These would be especially great for Mother's Day paired with a bottle of wine. Continue to 5 of 100 below. If you're on the hunt for a DIY gift idea that's truly unique for someone who loves a stylish accessory, we've got you covered. Grab a pretty placemat and work a little sewing magic to create this one-of-a-kind clutch that'll have everyone exclaiming, "Where'd you get that?" At this point, we're sure you've seen those gorgeous chunky arm-knit blankets that have taken over our Instagrams and Pinterest Boards. Make someone in your life very, very happy by gifting them this blanket that you've DIY'ed. Are you attending a baby shower soon? Whether you go with a gift from the registry or not, consider adding this very personal and adorable homemade gift. Adorn a plain onesie with the embroidery pattern of your choice and the momma-to-be will truly appreciate this standout piece among her newly acquired collection of store-bought baby clothes. Headphones break all the time, and unless you dole out a big chunk of change for a quality pair, you have to constantly replace them. Keep the wires safe from everyday wear and tear (and make them look pretty!) with this neat embroidery DIY. Give a pair of these to someone you know who would appreciate these for their daily use. Bonus: the creator of this craft noted her wires no longer get tangled with the embroidery cover. Continue to 9 of 100 below. Finding a place to store your jewelry can be a nuisance. This cute cactus ring holder also doubles as decor. It's a cool gift for that someone in your life who appreciates a fun surprise or something that's out of the ordinary. These champagne flutes are so simple and chic. A set of two makes a perfectly fine gift on its own, but add a bottle of bubbly, a set of coasters, and even some gourmet cheese because wine not? The sweetest housewarming gift, this string art project is easy to do. The craft itself is versatile; feel free to use a different shape from the house; try a pumpkin for fall or an evergreen tree for Christmas. Budding writers, doodling daydreamers, dedicated journalists, and serial note-takers are all ideal recipients of this special DIY. Bound a notebook in leather for a meaningful, yet startlingly simple gift. Continue to 13 of 100 below. For Christmas this year, send out these pretty embroidered cards. They are easy to stitch even for beginners. Make it a group activity and mail one to everyone on your list. Every woman knows that humidity can be a hair-ruiner. Gift your girlfriend a bottle of this DIY lavender anti-frizz spray when she needs it most (hint: summer). A little humidity is okay (in fact, appreciated) for beachy waves, as long as you can control those waves before they go wild! A traditional bouquet is a go-to gift, but imagine the look of delight on someone's face when they receive this gorgeous embroidered bouquet. This embroidery project is extra special because it uses ribbon instead of a string. Moscow Mule drinker or not, who wouldn't love to add some copper mugs to their collection of housewares? This DIY tutorial shows you how to add subtle engravements to personalize these already super-cool mugs. Continue to 17 of 100 below. Pretty and feminine, it's hard to believe these cases aren't store-bought. Your friend will be thinking the same thing when they unwrap this gift. These pom-pom earrings are super creative and fun. Make these for a friend so she can showcase her style. A sweet smelling hand scrub is a wonderful holiday gift idea, but you can gift this any time of year for any occasion. We love it for fall and winter especially, and you'll be hard-fought to find someone who wouldn't love receiving this little jar. We don't know about you, but we just found out you can make your nail polish and ​we. Are. Floored. Customize a color for your best friend, mom, sister, wife, etc. and surprise them with arguably the coolest DIY ever. Continue to 21 of 100 below. These pretty bookmarks are the perfect kid-made gifts. There's nothing better than a child's delighted face when he or she presents their masterpiece. The perfect gift for bridesmaids, this DIY wire gift bow necklace is a pretty piece of jewelry that brides can hand out to all of their ladies in waiting before the big day. It also works well for a young woman's milestone 16th or 21st birthday, for Mother's Day, and Valentine's Day. If you don't have your wood burning tool, you might just be convinced to buy one after you see these beautiful kitchen utensils. You could easily pass these off as expensive artisan finds. This ingenious method of transferring a photo onto wood gives a meaningful memory a more sophisticated appearance. This is an excellent gift for an anniversary, birthday, or wedding. Continue to 25 of 100 below. Create a brand new signature scent of your design, making for a unique and personal gift. This tutorial walks you through the basics, using ylang-ylang, grapefruit, and vanilla oils, but the instructions are easily adaptable for any scent combination. Replicate the look of an antique locket with this DIY beaded picture pendant. This is a special gift for someone you love, and it's especially perfect for Mother's Day. If you're giving the gift of a lovely bouquet, why not go the extra mile to create your gift wrap? It really couldn't be easier, and this tutorial will show you exactly how. Macrame has made a significant comeback, and these hanging plant holders are ideal for small spaces adding a bit of greenery and a bohemian flair to an apartment. We think these make an excellent gift for almost any occasion. Continue to 29 of 100 below. Some basic sewing skills are all you need to create these adorable slippers! We love these for Christmas morning, but they certainly work for birthdays, Easter, Mother's Day or other special occasions. Stitch up a leather-like embroidered cuff with one of these designs. The patterns are easy to follow for beginner stitchers, and the result makes a cool customized gift. Create a set of these beautiful, artistic plates for a wedding gift, bridal shower, or housewarming present. One-of-a-kind dishes always make a great gift idea. These pretty DIY earrings are the perfect way for you to try your hand at origami. They are a great small and inexpensive gift option and can be customized for anyone. Continue to 33 of 100 below. Rustic and modern, we love the farmhouse-feel of this DIY wine rack. Outshine the other guests at a wedding by bringing this into the reception–the bride and groom will not be disappointed. Skip the baby registry (or add on top of it) with this cute and clever mobile. These whimsical hot air balloons would look so sweet in a nursery for either a baby girl or boy. Bring the beauty of a tropical vacation to someone's home with this fun and bold display of art. This would make a special housewarming or hostess gift. Here's a smart way to use up your leftover yarn. This pretty necklace is a great gift idea for your friend who has a fun and eclectic style. Not sure how to wear this? This bold statement necklace dresses up a neutral button-down blouse or crew neck tee with instant cool! Continue to 37 of 100 below. These charming candle holders make perfect gifts for practically anyone. They're a great way to disguise mismatched candle jars or to hide brand names. Have a friend with a summer birthday? Surprise him or her with this easy-to-make picnic blanket and spend the day together at the park or beach. Save your friend a couple of hundred dollars when you make them these colorful accented tassel pillows that resemble a more expensive pair from Anthropologie. They probably won't even realize these are handmade! These fun pom-pom wreaths aren't holiday-specific, so they'll accommodate just about any holiday and any occasion. You can make an all white one for winter or try an array of colors and give it to a college student to decorate the dorm room. Continue to 41 of 100 below. How beautiful is this birdbath? While gifting a whole birdbath might seem like a bit much, we think this idea would look just as great on a dish or bowl! There has never been a better way to use up old CDs. Another great idea for baby shower gifts is this adorable embroidery border design. Create something special and frame it in a hoop for a personal gift that would look lovely in a nursery. Know someone who's got the travel bug bad? Plane tickets are probably a welcome gift, but the expense isn't something everyone can afford. Instead, make this thoughtful artwork using a map from their favorite destination. They'll love this incredibly thoughtful gift. Ten minutes is all you need to make this sweet-smelling soap. Make a few bars and tie it up with a ribbon for a pretty, simple and thoughtful gift. Continue to 45 of 100 below. We love a DIY that recycles objects we'd usually toss without a second thought! These transformed sugar bags look like cool rustic planters that would look great on any desk. Whether you know someone who loves to entertain or are in need of a housewarming gift, these reversible tassel placemats are a fun and unique gift idea. We love the colorful choices in this DIY, but you can customize with any color or printed fabric. We all have that one friend who bravely walks around with their phone without a case. Stop the madness by gifting them this unique DIY case. Even if all your friends have cases on their phones, we're sure you know someone who would love to receive a new one-of-a-kind phone case. There are so many occasions where this gift is perfect: send it in a care package to college students, give it someone who's sick, make a bunch for the holidays and yours will stand out among all those jars of cookie and hot cocoa mixes. Continue to 49 of 100 below. If you're planning to gift a plant, go one step further and DIY these incredibly easy, personalized flower pots. These are so cute and easy to make, you might end up with one for yourself! What parent or grandparent wouldn't love to receive these tiny handprints? It won't be hard to get your kids to participate in this craft since handprint and fingerprint crafts are always a hit with kids. These galaxy coasters are so fresh and trendy. They'll certainly stand out as a memorable gift to anyone you make them for. This fluffy bath towel is the warmest and coziest way to embrace your child in an endless hug. Give them as gifts to all the kids on Christmas Eve, and everyone can come downstairs Christmas morning wrapped up in their new hooded blankets. Continue to 53 of 100 below. We know this DIY tutorial uses wedding photos, but you can use any photo to turn this into a personalized gift. Think birthdays, graduations, anniversaries, "just because" moments. There are no limitations on the gift of a good memory! This idea has the potential to be even more special. Hear us out: DIY a special message in a cake pan, fill it with a cake, deliver said cake and wait for the phone call that comes when the cake has been eaten, and the surprise message at the bottom of the pan has been discovered. We think this could be even sweeter than the cake itself. Older generations handing down family recipes to younger generations has always been a sentimental gesture everyone appreciates. Take it one step further with this DIY idea and once completed, surprise someone in your family with all of Grandma's cooking. For those times when you need a card, try your hands at this easy pop-up card craft. The recipient of your handmade card will surely know you were thinking of them when they see the effort you put into the gift. Continue to 57 of 100 below. Okay, this might be one of our favorites. For those family members who live farther away, surprise them with a big "hug" in the mail, so they know that you love them this much. Weddings are expensive, and there are so many details to worry about. Bring some ease-of-mind to the bride-to-be in your life by making her this beautiful, simple embroidered ring pillow. This is a thoughtful touch she'll surely appreciate. College bookstore clothing is expensive, and college students can barely afford their textbooks. Help them out with this easy school scarf–no one will even know it's homemade, and when they find out, it makes it even cooler. While some of us practically bleed coffee, others of us prefer tea, and that's okay. Put together this clever tea wreath for the friends who will appreciate this. Continue to 61 of 100 below. From confetti wrap to 3-D paper, these clever ideas will delight the recipient of your gift before he or she has even opened it. You know how Dad is always the hardest to shop for? Skip the tie or assortment of craft beers this year and DIY these mini toolboxes made out of Altoid tins. They're perfect for holding nails, screws and the like. We bet Dad will be so impressed by your innovative thinking this time around (We won't tell him we gave you the idea). In a world that's centered around Instagram (and in this case, Instagrams that are centered around dogs), we can't think of a better calendar idea for friends and family. Just be sure to skip the selfies and pick more meaningful photos. Even if you've never been to Italy, you've probably tasted Limoncello and know just how lemony and delicious it is. Mix up your batch and fill up mason jars with it. Then top them off with the free printable labels included in the tutorial. This is a great gift for college students planning to study abroad or anyone at all! Continue to 65 of 100 below. No-sew fleece blankets have been a popular craft for some time. These cozy throws are SO easy to make, and this tutorial shows you how. Give these out as Christmas gift, for winter birthdays or any other time of year when warm blankets are coveted! This "pineapple" is so clever, you might not even realize there's a wine bottle in there! Wine and chocolate are usually a welcome gift, and this easy DIY takes the presentation factor up a notch. This gorgeous flower chandelier uses fake flowers, so it lasts. Make this for a bridal shower, baby shower or wedding, and we guarantee the bride- or mamma-to-be will swoon. We love both the rustic charm and pretty blue color of this DIY mug holder. This is a beautiful homemade gift for new homeowners and serious coffee or tea drinkers. Continue to 69 of 100 below. It doesn't get any easier than this; draw some designs or write an inspirational message on a plain white mug, bake it in the oven and you have an inexpensive, personalized gift in no time. This baby cocoon pattern can be worked in any color and is quick and easy to create. Gift this to new moms to mommas-to-be at their baby showers. There's nothing you can't put in a jar! Show up to your next party with this and everyone–not just the hostess–will love you. A teddy bear is a classic child's toy. Stitch up a little nostalgia with this crochet teddy and gift this at a baby shower or kids' birthday party. Continue to 73 of 100 below. Would you believe it: to make this tote, you hammer flowers into the fabric. Sounds a bit strange, but look at those results! We love this as a Mother's Day gift. If bath bombs are too trendy for the giftee, go traditional with sweet smelling bath salts. Pack these up in a mason jar and add some ribbon with a little note for the perfect hostess gift. We admit this one's a bit silly, but it's also entertaining. Every cat owner who's ever complained about how unsightly cat scratching posts are, rejoice! This clock is for pure aesthetics, and we love it so much, we don't mind that it doesn't tell time. With some paint, stickers and pre-made wooden rounds, this "woodworking" project couldn't be any easier. Continue to 77 of 100 below. Modern, trendy and fun, this wall hanging would be a cool gift. You can make in any color or a variety of colors to fit the tastes of the person you're making this for. Whether it's summertime or you know someone who loves beach decor, these mason jar lanterns are made out of sea glass. They're an ideal gift for each case. Make a set for a friend and bring them over the next time your friend hosts an outdoor party. Whether it's your dog's birthday or you have a friend with a dog, whip up a batch of this pup-approved "frosting" and coat some dog treats in the icing. What dog parent wouldn't love to receive a bag of these colorful biscuits? Know someone who suffers from allergies? This DIY tissue holder is a sweet gesture that they'll surely appreciate. Continue to 81 of 100 below. This is a fun and easy gift to make with kids! They're squishy and colorful, which makes them an excellent gift for kids as well, but they're perfect for adults too. Pair a few of these with a bottle of wine and some homemade bath salts, and you've got the ultimate stress-reducing gift set. An elegant and formal way to display cakes, cupcakes, and pastries, cake stands are a delicious gift idea. Bring this to a housewarming, birthday or for any friend who loves to bake. If you know how to crochet, this gift idea is an excellent option for any occasion. We love the idea of making these for the young adults in your life who've just moved into their first home or apartment. Take an old or vintage-looking belt and turn it into a camera strap. Whether the person you're gifting is amateur or pro, any photography enthusiast will love this gift, as it's unique to their craft and just plain cool. Continue to 85 of 100 below. Elementary and high school students, recent high school graduates on their way to college and recent college grads off to their first job would all appreciate some extra pencils. The gold marbling on these pencils is beautiful. They'll undoubtedly spruce up any desk. This leather pouch is the perfect size for holding small items like keys, makeup, money, cards or anything else! The minimal look of the leather is suitable to anyone's style aesthetic, and who don't have a use for an additional way to keep their things organized? Simple and elegant, a boxwood wreath is a beautiful addition to both holiday and everyday decor. This one is faux so that it will last. The DIYer who created this project was able to craft her wreath in 20 minutes for $12! Are you looking for a 21st birthday gift? Take a generic flask and give it some life with this easy customizable DIY. Continue to 89 of 100 below. Okay, so this one requires some real woodworking skills, but if you can do it, this beauty is sure to be a head turner at any party. A cooler twist on the friendship bracelets you probably made in summer camp as a kid, these braided leather bracelets are the grown-up version. These gorgeous beeswax candles make great holiday or hostess gifts. 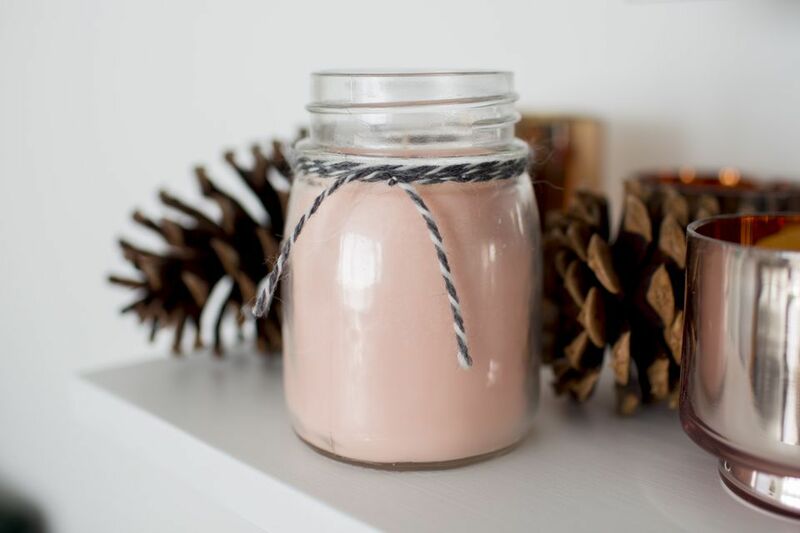 Unlike some other types of candles, these are super easy to make, too! Do you know someone who loves puzzles? This DIY allows you to personalize any jigsaw with an image of your choice. Be warned this project requires patience and precision, so it may be a bit too ambitious to try for a 1,000 piece puzzle. Continue to 93 of 100 below. If you want to give a small gift to your child's new teacher at the beginning of the school year, try your hand at making this origami apple. 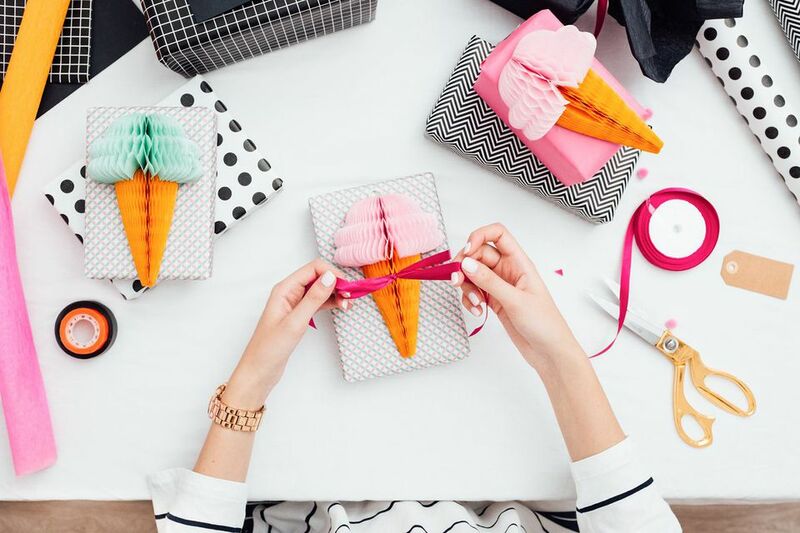 This clever paper folding project is a modern take on the traditional gift. This tutorial comes with a free printable template, so creating a candy gram has never been easier! This clever idea for a friend's birthday is sure to crack a (sweet) toothy smile. Candy Gram Birthday Card from Who Arted? The holidays are a time when you want to shower absolutely everyone you know with gifts. That can get expensive. These mason jars filled with cookie mix are an inexpensive but creative idea for all the friends in your life, not to mention your 17 cousins, 12 aunts, and uncles, mother-in-law, step sister... you get the idea. Anyone who loves to entertain would appreciate an extra set of salt and pepper shakers. These are minimal and chic, so they'll blend in with almost any tablescape, holiday or not. Continue to 97 of 100 below. We all have that one friend or family member (ditzy cousin, anyone?) who's always losing something. This catchall dish has a clever DIY feature to help you keep track of your house key. It's amazing how one little fern leaf can transform an ordinary towel into a modern masterpiece. Some green paint is all you need to stamp your leaf onto a plain linen towel. Go one step further and create a whole set of beautiful stamped linens. The wrapping and presentation can be just as much a part of the gift as the gift itself. Transform an ordinary gift box with a pretty handmade paper flower. These boxes are perfect for gift cards, jewelry, candy, and other small gifts. While a utilitarian-style apron is better suited for messy and practical tasks like cooking and cleaning, a pretty hostess apron is ideal for entertaining. By the time guests have arrived at the dinner party, they'll know nonetheless that you were wearing anything less than your best the whole time. This is the ideal gift for your friend who loves to throw a good party.